April 22nd was an exceptionally important Earth Day, now in its 47th year. Leaders from 175 countries signed the Paris climate agreement. This action at the United Nations in New York represented a critical step. With their signatures, the leaders committed to strategies and timeframes that will slow the accumulation of greenhouse gases. The ratification process continues. It is dangerously slow, but awareness and determination over these past 46 years have at least led to agreement. 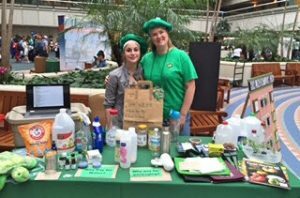 Several ecoPreserve team members participated in Orlando International Airport’s (OIA) Earth Day reaching out to the 100,000 visitors that pass through daily at the airport. 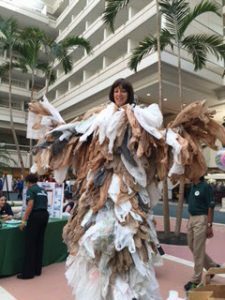 The Airport Green Team (GOAA Green) took a fun approach with educational games, prizes, and special guest appearances from the Bag Monster. Chanel Jelovchan, one of ecoPreserve’s Sustainability Specialists, brought attention to the issue of plastic bag waste. Her Bag Monster costume demonstrates the impact each person can have. The costume consists of over 600 plastic bags representing the number of bags the average American uses each year. Another Sustainability Specialist, Sarah Hamoui, and Jessica Wright, Project Manager, challenged passersby in a matching game called How Long Until I’m Gone. Participants matched pictures of different objects with the years the object needs to decompose. Tasteful Recipes – All Free! Our card stand was popular even with those who passed by the game. Clothespins attached unusual but quite practical recipes to the rack. Did you get your copy? 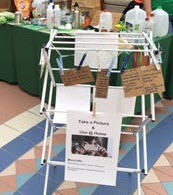 If you missed Earth Day at OIA, use the Reach Out form on this page or drop an email to info@ecopreserve.net. We’d like to hear from you, but your email can be blank! All we need is Recipe Request in the subject line of your email or the form. You will receive a complete set. LEED AP, Sustainable Facility Professional, Envision Sustainability Professional - - Alexa has more than 25 years of experience in sustainable and Smart Cities development. Her strategic planning work has served local, state, and federal government, higher education, and private industry. Alexa founded ecoPreserve in 2009 as a team of 3 and has grown the company to over a dozen of the brightest sustainability and project management professionals in the industry. Helping organizations improve operations, reduce costs and achieve sustainability through data driven, efficiency focused, planning, reporting & certification. Previous story Why drive to the gym or plug-in the treadmill?